Sorry for the late post. I got back home in the wee hours of the morning. My husband took our sons to their first NFL game on Sunday. Buffalo @ Jacksonville. The Jags lost (soo sad). But my fellas had so much fun. I guess that makes up for their team loosing. Now on to our Stampin' Buzzziness. 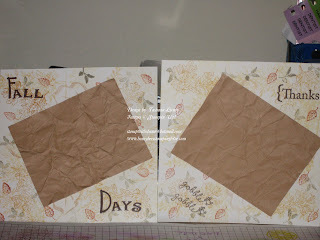 Here are two 6x6 Fall scrap book pages. I cased this from someone on SCS. I just love the combination of colors. The background was stamped using Lovely as Tree stamp set. These pages were very quick and easy. My husband thought I used DSP. I used these pages in a scrap book I made for my sister-in-law and another for a friend. I hope you like it. Let me know what you think.